The PE division has an experienced team to execute virtual stamping try-out with PAMSTAMP and one step simulation modules like FTI. DFM Review by Macro-Feasibility: Experienced engineers provide valuable feedback prior to simulation by visually reviewing panel CAD data. Feedback related to improving trimming condition for higher steel life, increasing material yield, part functional aspect and part shape (e.g. undercuts, abrupt geometry changes etc) are normally given. One Step Simulation: Use of FTI one-step simulations to minimize Pam-stamp trials. Micro-feasibility: Virtual tryout for draw operation is simulated using Pam stamp. wrinkles prediction, thickness distribution, spring-back trends, FLD circle grid analysis, strain distribution analysis, Shock line / Skid Line / Draw-in prediction is possible. A number of iterations are done with intermediate drawn part modification until satisfactory results are obtained. Process Simulation for all subsequent Forming Operations: Simulating Restrike, Flange and Cam forming enables capturing of deformation occurring in post draw operation and soft condition verification of trim line. Complete Process Simulation: Identifying the root cause of spring back so that compensation is added in appropriate die. Spring Back Correction through PS2G Die Compensation: Many times it is identified that spring compensation should be given in draw tool even before machining tools. Doing this is possible with PS2G software in certain cases when adjacent illustration clearly shows the comparison of actual and simulated Pam Stamp spring back and compensation done in Pam stamp. Redesign: In case of critical panels that have noteworthy feasibility problems, the support of redesigning panels taking cognizance of vehicle level assembly and engineering constrains is an added advantage if products are ready for production due to feasibility study at the design phase itself. PE manages tool design in 3D using CatiaV5 and Pro-E (especially for foundry tooling). Data management is through Teamcentre PLM. 3D visualization in ".jt" files format and large standards library. Some added holes require additional die stamping operation that cannot be accommodated in automated press line. Piercing tools for such add-on holes are needed many times for a short duration or for low volume requirement. PE can design piercing tools with Hydro-pneumatic systems that handle selectivity in pierced holes enabling multiple-variant management. Special Purpose Foundry Tooling like Final Core Setting Fixtures, Core Drilling Fixtures etc. PE masters the process engineering for welding of car bodies in all conceivable variants, from the smallest bracket to the complete body-in-white (BIW). 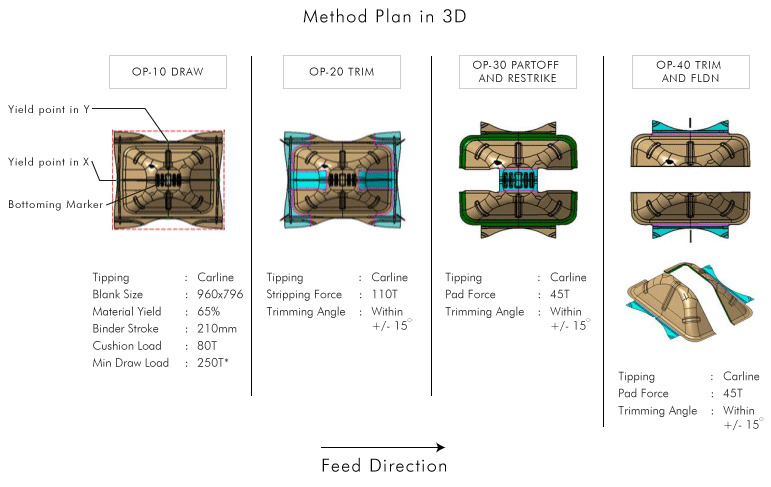 Work includes defining the family tree for BIW, defining locating and clamping strategy and PLP co-ordination through stages, defining the sequence of loading parts assembled, and spot allocation to meet tack time. In executing this process the overall product quality is enhanced and an assembly process facilitates trouble free manufacturing. Sheet metal welding experts work extensively on feasibility of BIW welding. Studying from ergonomic perspective to enable ease of handling welding and safety.